I’m privileged to live where I do: my school accommodation backs on to rural countryside on the edge of Cranbrook. It means I’ve had some pretty great birds from my living room window, including a kingfisher who visits the pond just across from me in the autumn and winter. 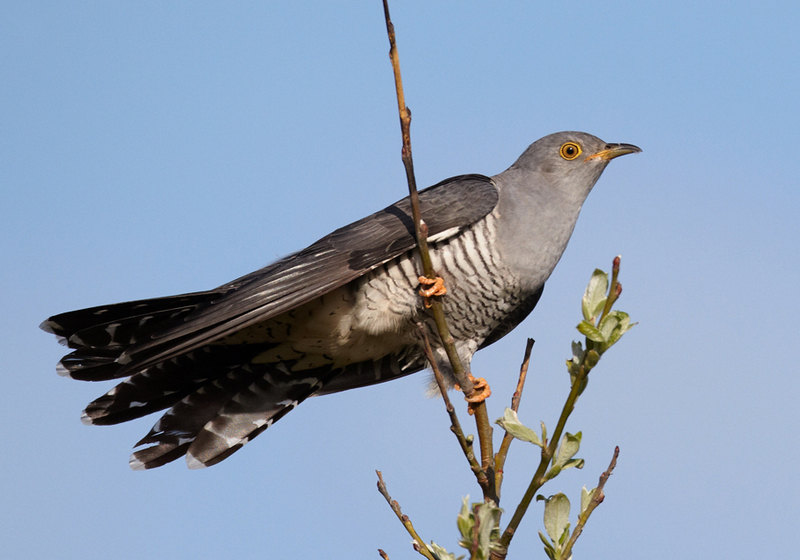 Last Thursday evening, I went out for a quick walk on the playing field behind the boarding house to watch the swifts screaming and careening over rooftops and my attention was immediately caught by an adult cuckoo working its way along the peripheral trees. The first I’ve seen in two years, and they only continue to get rarer (see here). This one quite happily spent a half hour feeding on grubs, flicking from the cropped grass to overhanging branches where it rested for short periods. Also discovered that a pair of grey wagtails are nesting behind a broken ventilation grate down the outside cellar stairs right outside my bedroom window! A postscript: Out for a walk today (Tuesday 17th June) on exactly the same field and I get another ‘garden’ first: a mediterranean gull with three blackheaded gulls! That must be pretty unusual for Cranbrook full stop! We have driven all the way south to this man-made lake east of Troyes in central France, and now we await their arrival. It is mid-February, and although the light is noticeably returning in the run to spring, at this end of the day it’s already gloomy. Back home there have been enough mild days – a bare-skin warmth and pure-air promise of daffodils’ lustrous yellows – to leave off thinking of thick coats and gloves and hats and double layers before exiting the house. This year, spring seems just right. The trees are still dark and skeletal though, and things can still turn … Here in France, the potential of spring is less apparent. All those layers are back on. In the distance I can hear some calling, announcing arrival long before they can be seen. I know what to listen for and think how ancient is this expectation, this anticipation of one bird species’ migration north, from Africa, from Spain, tracking immemorial flight paths up to the Scandinavian taiga, young and old, generation after generation joining others in huge numbers right across the Siberian steppes from one end of Russia to the other. The more eastern families move north from wintering grounds in the Middle East, northern India and eastern China. Cranes are some of the oldest species of bird on earth. The European crane’s cousin in America, the sandhill, is known through fossil evidence to have existed in Nebraska in the Miocene, nine million years ago. In Europe, crossing the Mediterranean, these birds caught the attention each spring of the ancient Greeks. Hesiod, in the 8th century, depicts cranes as a conspicuous herald of warm weather. His farmers’ ‘almanac’, Work and Days, observes the birds as the sign for the year’s busyness to begin: ‘Take heed when you hear the voice of the crane from high in the clouds, making its annual clamour’. More famously, in The Iliad, Homer draws upon the familiar site of migrating cranes over the Cayster River (in what is now Turkey) to furnish a vivid metaphor for the invading Greek armies ‘gathering now / as the huge flocks on flocks of winging birds, geese or cranes / or swans with their long lancing necks – circling Asian marshes / round the Cayster outflow [at Ephesus], wheeling in all directions, / glorying in their wings – keep on landing, advancing, / wave on shrieking wave and the tidal flats resound’. It is the long necks that appear first. And legs, rangy legs so that the birds appear all long neck; few at first, then continuous extended columns, as though each bird is threaded on one silk twine to the next. The numbers and volume grow, and bare mud fringes or islands disappear as the birds mass in to roost, some leaping and jerking beaks upwards in momentary preparation for their breeding rituals on the bog sites. They fly, not with an owl’s soft and silent ease, but still with languorous elegance. Not the flurry and burst of waders, nor the heckling of winter thrushes. Even their clamorous call is smooth, ordered – the engine of their vast, beating wings. I think of home. Cranbrook. It carries the name of these birds, from Anglo-Saxon cran. Although we cannot be certain that this word was not used to label several heron-type birds by early medieval people, the fact that Old English texts do specify hgraga for heron implies that they did, in fact, differentiate. Whether cranes or herons rightly provide the origin of the town’s name, there are certainly enough place names cognate with cran across England to denote the species’ former distribution, like many wetland birds before the early modern drainage programs. They have now recolonised in the UK, appearing first at Hickling, Norfolk, in the decade I was born. In more recent times, they have been re-introduced to the Somerset Levels too. Medieval illumination, Ashridge College Historia scholastica of Petrus Comestor. B.L. MS. Roy. 3 D.vi, f. 1116r. (Source: British Library archive gallery). English cranes are resident birds, though, and I want the migration. I want to see and to hear one of the world’s most spectacular events, to be a part of these birds’ monumental annual journey. To experience the cranes’ great flight is to know the flux set in motion at this time of year, the movement at the heart of those words for nature itself (Indo-European gn became the root of Latin natura, and bheu the Greek physis. Both words are bound up with the senses of birth, growth and movement.) And so I’ve made my migration to meet theirs – a pilgrimage for the remarkable – to coincide at Lac du Der for a brief time in February before the zeitgebers (‘time-givers’) prompt their departure north. There are resident birds here, too, but if you want numbers, the colossal din that shows the earth’s steady turning, you need to time it right. If the weather is too cold or too mild the birds may not stick around. At peak numbers, though, the cranes can amass in excess of 100,000 individuals. We stay until dark, hanging on for the last groups to fly in from the flat surrounding fields. There are always more; dark, faint processions in the granulating light, till eventually I cannot tell cranes from sky or water. Their orotund calls persist, the black tips of their broad wings closing over and into the dark horizons of lake.